Obverse: (rosette) BARTHOLLOMEW.FISH , around twisted wire inner circle, three fishes within. Reverse: (rosette) AT.QVEENEHITHE.1667, around twisted wire inner circle, HIS / HALFE / PENY , in three lines. Below a rosette flanked by two sets of three dots each arranged in a triangle. Bartholomew Fish is recorded as a fletcher living in St. Michael’s Parish, Queenhithe. This was a dock on the north bank of the River Thames. 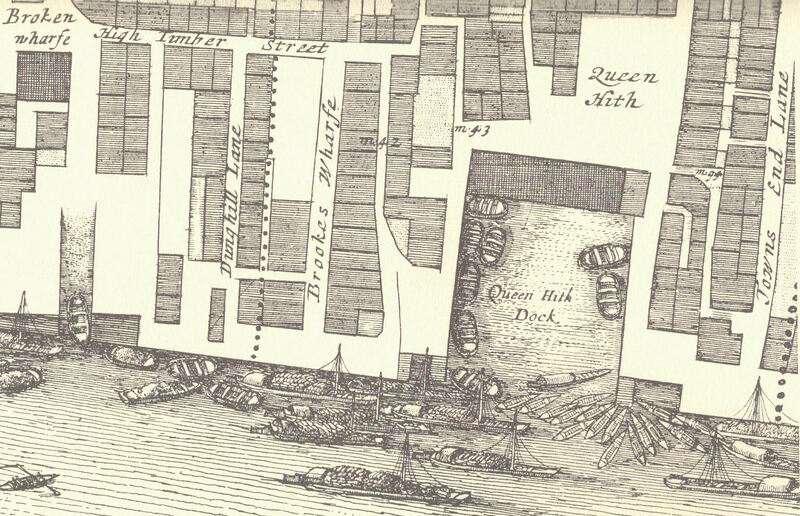 It was bordered by Thames Street to the north, Brookes Hill Wharf to the west and Towns End Lane to the east. In the 1662 Hearth tax return Bartholomew is recorded as occupying a property in the third precinct of St. Michael’s, Queenhithe Ward, having five hearths. This area the city was totally consumed by the Great Fire of 1666. In “The survey of Building Sites in the City of London after the Great Fire of 1666” an entry is recorded on the 21st June 1671 for the receipt of money for staking out the foundations of a property in Queenhithe belonging to one Bartholomew Fish. Bartholomew Fish was married to Martha Fish and between them they are recorded as having four children – Elizabeth, Martha, Mary and Rebecca. A copy of Bartholomew’s will, dated 1676, is held in the National Achieves (Kew) in which he leaves his estate to his wife and four daughters. By this date two of his daughters had married, Martha to Nathaniel Mason and Elizabeth to William Noble. His will was witnessed by Edward Reeve and Jeremy Holmes. 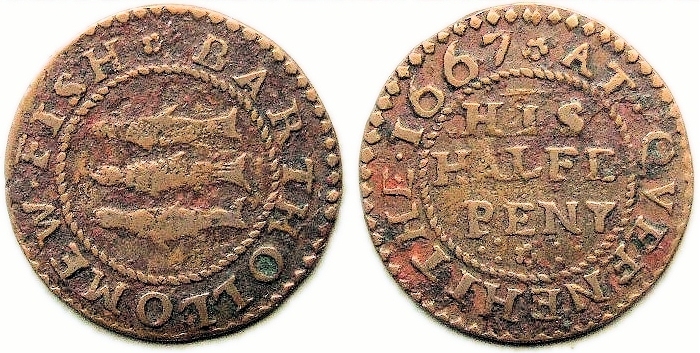 At further farthing token is recorded bearing the obverse device of three fish and carrying the reverse issuers’ initials of B. M. F. The obverse and reverse legends this token attest to the issuers trading at the sign of the Nobel Garter in Queenhithe. This token was almost certainly issued by Bartholomew and Martha Fish. The obverse device of three fish on this token is probably a play on words given Bartholomew’s surname.